The post below is actually a copy of a weekly e-mail that I send to our staff to promote our Burlington Public Schools Blog which shares the great work going on across our school district. I also try to give a quick technology tip/resource that I think would be useful. It is the 13th post in the series. Checking in on the insights from the district Facebook page, we recently had a noteworthy occurrence with a post. A typical post on the page usually garners a reach total in the low hundreds and on rare occasions we have posts that reach over 1,000. 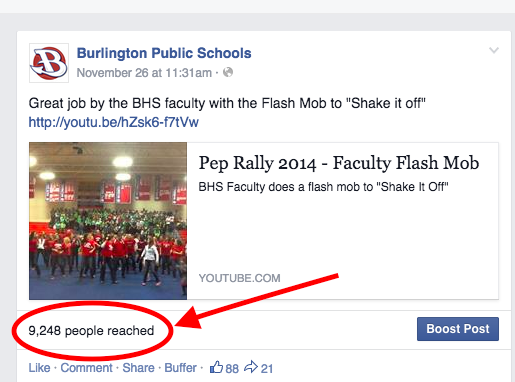 But the BHS flash mob from the pre-Thanksgiving Pep Rally more than tripled the previous high for the reach of a post with over 9,000 people reached! Let’s see who can top that! As always, feel free to forward any posts that you would like to share on the BPS Facebook Page, the BPS Blog, as well as photos for the BPS Instagram account. We scan the district blogs and websites for material, but there are always things that fall through the cracks due to the volume of online sharing across the district.